This first prize is free for everyone participating in the read-a-thon! Brady Koch lives in Aurora, Illinois with his wife and two children. Feel free to read over his shoulder if you see him working on a new novel or short story at the coffee shop, library, or BNSF Metra commuter train into Chicago. Jared Sandman lives on Florida's Gulf Coast, where he's working on his next novel. Visit his website at JAREDSANDMAN.COM for free stories, updates and discounts, or follow him on Twitter (@JaredSandman). Giveaway Details: This is a read-a-thon participant only giveaway. To be eligible, you must sign in at the starting line post when you start to read and complete a wrap-up post at the end and link it here at Seasons of Reading at the official read-a-thon wrap-up post (I will give everyone until Tuesday (5/6) at 11:59pm CST to complete their wrap-up posts). We have a total of 4 prizes (not including the free download for anyone who wants it Numbers 16:32). This means there will be 4 winners. I'm going to do things a bit differently this time and this is only because it takes so long the way I was doing it previously. I'm going to award prizes as they do during Dewey's Read-a-Thon. That means first come, first served. I will draw the four winners with random.org and email all four at the same time. The first person who emails me back with their choice gets that prize. I will mark off the prizes as they are taken. All eBook prizes will be sent to winner via email - please specify what format you require in your email. Winners will be chosen after the wrap-up post deadline (see above). Welcome to the starting line. I know...I'm late!!! Sorry! Are you ready for some scary reading? I hope everyone is not worn out from Dewey's 24 Hour Read-a-Thon. It's time to put some scare in our Spring! I will have the prize page posted during the day on Monday (or Tuesday) so come back here to find it (Unfortunately, the prizes are slim pickings this time). I will also have easy access links at the top of the blog to the prize page, the sign-in post, etc. Okay, I think that's about it. I hope you all have fun this week. If you have any questions, please leave me a comment below, or contact me via the form by clicking the 'contact' tab at the top. 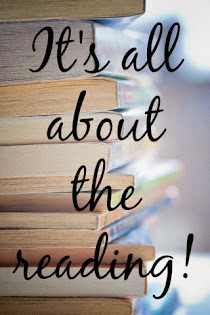 I will be posting my updates at my blog, The True Book Addict, so I hope you will stop by and visit me. 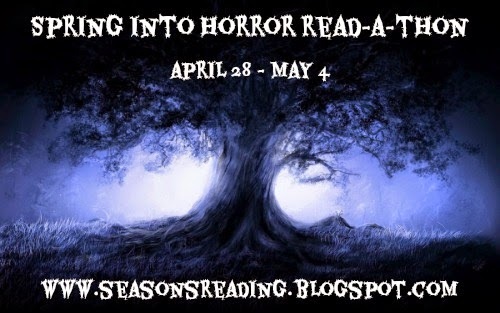 The Spring into Horror Read-a-Thon is almost here! It's coming to put some scare in your Spring on Monday, April 28 at 12:00am CST through Sunday, May 4 at 11:59pm CST (adjust times according to your time zone). Now don't let the word 'horror' scare you away. You only have to read one scary book during the duration of the read-a-thon. However, that book can be horror, paranormal, thriller, mystery, etc. The rest of the read-a-thon, you can read whatever you want. More horror/scary stuff or just your regular reading repertoire. As always, this is a week long read-a-thon, but you can join in and read whenever it's convenient for you. It's all about being laid back and getting some reading done...with a little bit of scary thrown in. If you are planning on joining me, please sign up in the linky below. You don't have to do a post now, but if you would like to help me spread the word, that would be great. (Don't forget that this is just the sign-up linky. There will be starting line sign-in and wrap-up linkies during the read-a-thon and doing both is required to be eligible for the giveaway). You can start any time during the week up until Friday night at midnight CST. Feel free to grab the button...the code is in the sidebar.